Nobody dishes out eye candy quite like Zack Snyder. In his first foray into fully animated fare, the director of 300 and The Watchmen has shot the most beautifully animated film produced outside of Pixar. It's a shame that it's a cliché-ridden, woefully derivative tale that doesn't give the children it's targeted at something more for their minds to chew on. 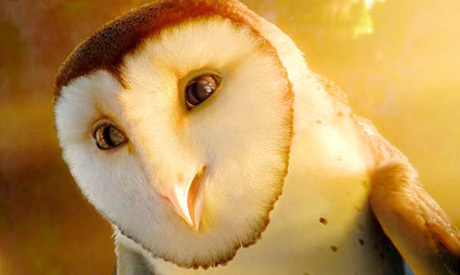 Culling its cinematic telling from the first three books in Kathryn Lasky's 15-volume series, Legend of the Guardians follows a young barn owl name Soren on a typical hero's journey. A sibling rivalry at the core of the narrative borrows heavily from The Chronicles of Narnia, minus the religious allegories, right down to an evil matriarch temptress. Soren is obsessed with legends of the Guardians of Ga'Hoole, so much so that his brother Kludd (True Blood's Ryan Kwanten) would rather practice flying ― something he's embarrassed his brother excels at ― than play act another retelling of an epic battle. Kludd pushes Soren out of the tree, sending both tumbling to the ground where they're owl-napped by minions from St. Aegolius Academy for Orphaned Owls. Here, young owls are put into slavery, to work in the mines or train as soldiers. In protecting an elf owl named Gylfie, Soren draws the attention of evil Queen Nyra (Helen Mirren). She sends him to be moon-blinked (brainwashed, lunar-style) and selects Kludd to be her loyal turncoat. From here, LotG takes the path expected, gathering mentors and a team of wacky personalities (like a digger owl who seems as highly caffeinated as the March Hare) to rally against the forces of evil. It's nice to have an excited protagonist for a change; Soren is absolutely thrilled to be part of a grand story, meeting his heroes while becoming one himself. Despite solid voice work, the characters have little chance to develop due to uniformly bland writing. The visual feast makes the experience enjoyable on a purely aesthetic level.